Bowen's Winter Soldier is a Great Surprise Package! Bucky Barnes may be on the losing side of the Marvel “Death of the Quarter” merry-go-round at the moment, but he’s been winning in the action figure and statue stakes in the last couple of years. 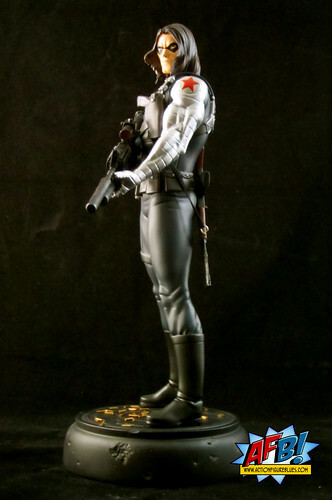 I’m reviewing the latest, the Bowen Designs Winter Solider Statue, this evening. After pulling the “Pre-Order” trigger at BigBadToyStore.com on this statue, I had a moment of uncertainty about the purchase, because close inspection of the preview pics made me a bit concerned about the headsculpt. I’m a bigger fan of Bucky’s shorter haired look in his Winter Solider guise, and this is a long haired version. 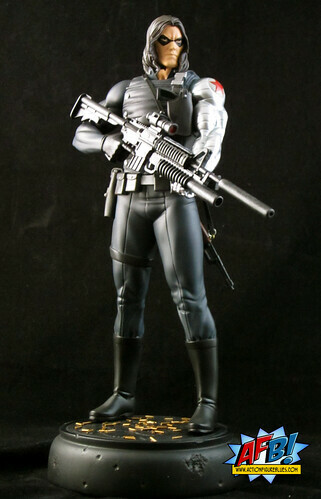 I couldn’t tell if it was sculpt or shadow that made Bucky’s face look a bit too thin. In the end, I decided to leave the order and hope for the best as I really am a very big fan of Captain America’s one-time kid sidekick. When I unpacked this statue, I was first relieved to see that my reservations about the headsculpt were unwarranted, and second stunned by how much detail on this statue I hadn’t noticed. This might seem like a simple piece, but it is actually quite complex in terms of both the level of detail and the concept. I wasn’t familiar with sculptor Khurram Alavi before this statue - but trust me, I am now. The man is a talent. Bucky’s Winter Soldier gear has a number of elements and textures, and Alavi has represented all of these very well in his design. It’s interesting to note that Alavi is a digital sculptor. I’ve read some criticisms of a lack of detail in digital sculpts - anyone who is concerned about it needs to have a close look at this piece. The fabric details are great, with small natural wrinkles and folds, particularly around the edges of his trousers and boots. His vest has great detail and texture on it, giving it quite a different look. The one issue here really relates to the otherwise stellar paint job instead of sculpt, and that Bucky’s robotic left arm would have benefited a more clearly metallic sheen to really make it stand out as metal. One thing I hadn’t noticed at all before I had this in hand is that the rifle that hangs on Bucky’s back is a separate piece. It has an elastic strap which allows it to be stretched around his arms to rest in the correct position, and is quite secure once in place. This is a great touch and a much better and realistic solution than having it as a fixed sculpted piece. Another stunning detail can be found on the base of this statue. It’s a small black base, easy on display space, which has an eagle emblem carved into it. Scattered liberally on the base are spent bullet casings, and the edges of the base are sporting some bullet holes and gashes. The bullet casings are fixed to the base so there’s no issue with small loose items rolling around - an issue with the gems that come with the Black Cat statue I’ll be reviewing shortly. The juxtaposition of the patriotic base and the mercenary bullets is a great representation of the dichotomy of Bucky’s life. It’s very clever design - and something I’d love to see Bowen do more. I don’t need diorama style bases - have to protect that display space after all - but a small touch like this does a great deal to lift the overall product and make this a statue I’m really proud to own. All up, this statue has turned out to be much more than a pleasant surprise. 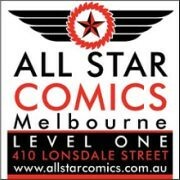 If you’re a fan of Bucky Barnes, it is something very much worth checking out. Discovering the very talented Khurram Alavi has also been a treat, and I am looking forward to his upcoming Bowen pieces and seeing him work on more projects in the future.